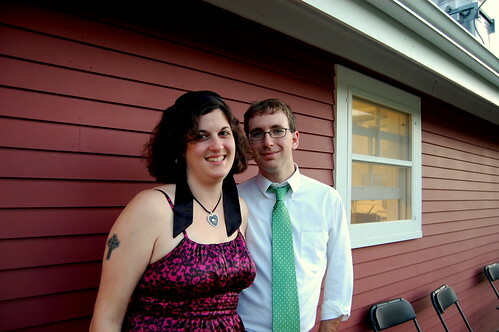 So as of 9:00 am Wednesday, the State of Vermont recognizes Megan and myself as a married couple. We filed the paperwork, visited a Justice of the Peace in Montpelier and tied the knot. We're husband and wife! - We wanted the married part to be for us. There's a lot of pressure, frustrating at times, to invite everybody and their friends to the wedding, and we didn't want to lose a whole lot of focus. The marriage was for us, but the wedding will be for all of us. - There's practical things that come with being hitched. Norwich has a great benefits system, and Megan, as my spouse, is now part of that, under my coverage. Saves us money, and should the worst happen, we'll have more options. - There's the whole madly in love with one another thing too. Plus, the combined wedding / marriage thing felt like this far off, distant, looming thing that would completely stress us out with the minutia and trivial details that come with the territory, and I can't help think that splitting the two apart a bit helps our (mine, at least) mental state. I don't want to go into a happy gathering worrying about X, Y and Z details, or the family elements that might not go off without a hitch. I'm looking forward to the next adventure already: I'll have my best friend, my wife, with me for whatever comes next, and I can't tell you how happy that makes me.